The return of the eel? The European eel is currently staging a remarkable comeback, with record numbers of juvenile eels arriving to the European coast from the Sargasso Sea for the third consecutive year. The reasons for the change in fortunes of the European eel are unknown, but it is thought that more favourable ocean currents are playing a role. What is clear is that this increase in numbers may only be temporary and everything needs to be done to make the most of this upturn. Some our River Maigue elver/glass eel catch using experimental dip nets. To help the eels it is possible to catch them in dip nets and other nets and transport them upstream around barriers and into suitable eel habitats in lakes and slow flowing rivers. This capture and overland transport approach of quickly translocating eels from estuaries to suitable habitats upstream will maximise recruitment. 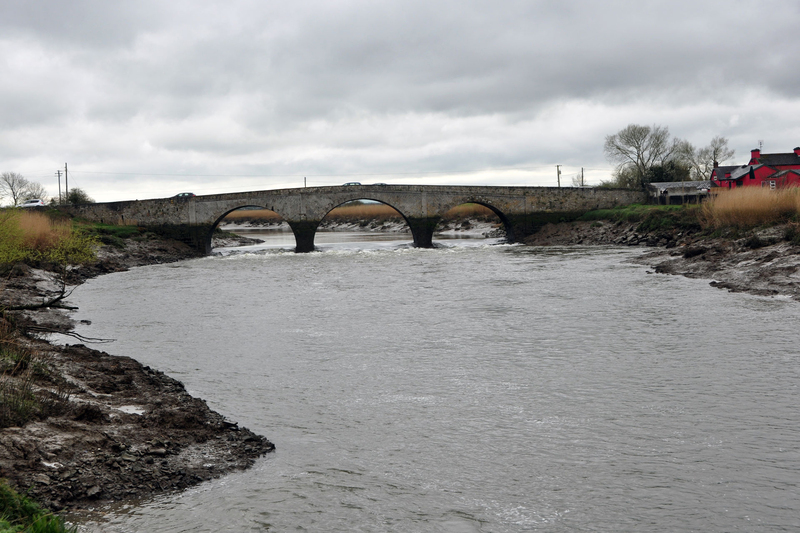 On rivers such as the River Shannon where there are hydroelectric schemes this work becomes even more important as the eels have no natural way to reach the productive eel habitats of Lough Derg and other Shannon lakes by themselves. The current upturn in eel numbers has been capitalised on in the United Kingdom withmillions of eels captured and transported upstream around barriers to migration and restocked into suitable habitats over the past few weeks. In the River Shannon catchment, and indeed in Ireland as a whole, practically nothing is being done and an opportunity to safeguard the future of the eel in Ireland and restore its fisheries is being wasted. There are elver traps at Ardnacrusha and Parteen and the ESB do run a trap and overland transport programme for juvenile eels. However the traps run by the ESB are very inefficient, are not operated or managed optimally. 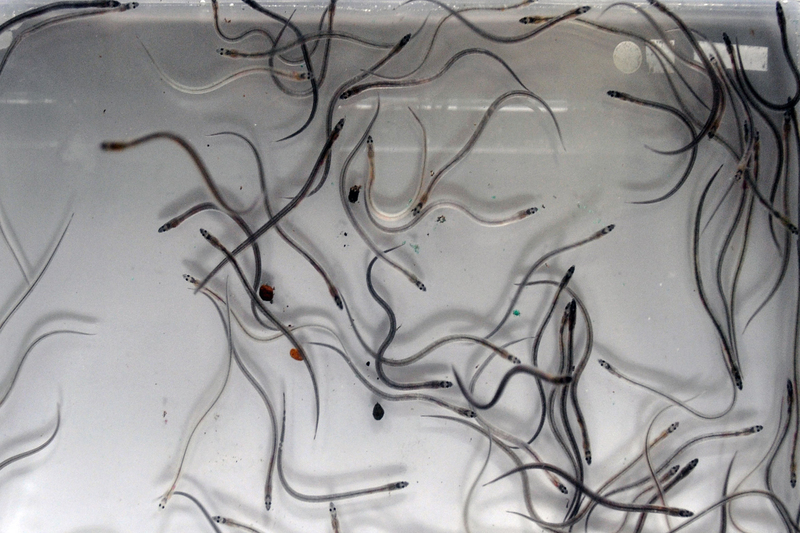 Most of the juvenile eels have died long before they even reach these installations. Although we are in the middle of third year of a major increase in the numbers of glass eels and elvers arriving into our rivers, this upturn has apparently not yet been registered at the ESB traps. Likewise elver index traps run by Inland Fisheries Ireland on the River Maigue, Inagh and Feale are only measuring one thing: the inability of this organisation to catch eels. The fact that the current management approach in Ireland is based on information from these flawed index sites is of serious concern. The vast majority of elvers ascending the River Shannon at present will never make it to the rich eel habitats of the Shannon lakes. This has to change before it is too late. This week we undertook experimental dip netting in the Shannon estuary and can confirm that there is again a major run of glass eels / elvers present. We made similar observations last year but the run this year may be even larger. This was backed up with the results from our dip netting work, and also from observations we made at a number of other sites around the estuary this week. We should be catching these eels and transporting them upstream to make the most of this remarkable upturn in juvenile eel numbers. Due to the presence of barriers on our rivers the eels cannot do this themselves and need this type of help. 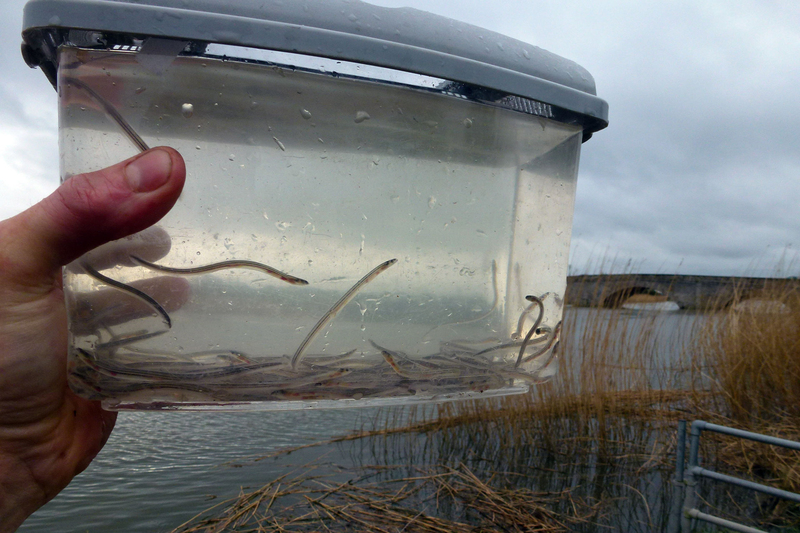 Glass eels/elvers from the Maigue estuary. If we stock the River Shannon lakes with these eels we can open our eel fisheries again and run them in a sustainable way. To ensure that that there is adequate eel escapement the ESB will need to start spilling water through Parteen weir (or install silver eel bypasses). We need to be involving communities and traditional fishermen again in eel management and getting rid of other forms of eel mortality, such as turbine passage mortality at hydroelectric schemes, instead. The eel can be managed sustainably in the River Shannon catchment, and Ireland as a whole, for the benefit of local communities and traditional fishermen, while simultaneously safeguarding the future of this enigmatic species. The collapse of recruitment of eels in the Shannon catchment is currently down to bad management and not due to the absence of juvenile eels. There needs to be change in the way that eels are managed in the Shannon Region, and indeed in Ireland as a whole. We advocate joining the Sustainable Eel Group and recommend opening sustainable eel fisheries again on the River Shannon. Inland Fisheries Ireland have had their chance now in relation to monitoring recruitment, and it is clear that they are not up to the job. Their monitoring only works when the eels are not there, and it is very worrying that eel managers in Ireland are using this type of data to make decisions. There is clearly a major turnaround in the numbers of eels arriving into our rivers, and it is time to capitalise on this opportunity. If you have any queries in relation to eels or eel management please do not hesitate to contact us.